I am totally annoyed with the date and time format of my PC. It is currently showing date and time format in Arabic. I don’t know even the a,b and c of Arabic so now I want to change it to english but not able to do that. Kindly guide me to change the date and time format. How to use Arabic Language in Windows xp? How to change Date Format on Taskbar in Windows 7? How to view full date on Windows 7 task bar? Now click on Region and Language Icon. Now Choose “English(United State)” from drop down menu. Click on Apply and Ok to confirm the setting. If you want some more Modifications then click on Additional Setting button. a box will pop up > go to "formats" tab >change the date and time format from there > click additional settings > from the numbers tab you can change the numbers to english. This is happening because arabic mode is on for date and time display. 1.click on start button and then open the control panel by clicking on the control panel in the right side of the box. 2.Now click on clock ,language and region. 3.Under Region and language click on change display language. 4.Now click change keyboards and then select english from the list then click ok.
5.Now in the Region and language window click OK.And you are done. Its very easy to change yar. Click drop down arrow under format and select the language that you want. Finally hit on OK button to save it. 3.Under the format Tab select your language of date\time to display and you confirm your selection. 4.Click ok. to enable your selection. To change the date and time with the region. Open the date and time settings. Than change the region and select the region which you want to chose. Click on apply and than press ok.
Open Regional and Language Options by clicking the Start button , clicking Control Panel, clicking Clock, Language, and Region, and then clicking Regional and Language Options. Click the Formats tab, and then, in the Current format list, select the locale to use for the display of the date, time, currency, and measurements. If you want to change time format then follow the steps. First go to control panel>date and time. There is option "change settings". Choose it and it will show the option box . Choose your reqirement . And click "OK". Then click "Apply" and "OK" to previous box . Now you problem has solved. 1.Open Regional and Language Options by clicking the Start button , clicking Control Panel, clicking Clock, Language, and Region, and then clicking Regional and Language Options. 2.Click the Formats tab, and then, in the Current format list, select the locale to use for the display of the date, time, currency, and measurements. >> Click below right corner of monitor at the bottom where time is displayed. >> a new pop box open which contains date and time and have a option change date and time setting. >> you can adjust time from here. >> If you want to change time according to your region then dear choose additional clock from the top of window make changes here and click on apply then ok now your task is performed. 8. from numbers tab you can change the numbers to english. If you want to change your date and time according to you. There is two way for you . You choose any way in between to way i am going to suggest you. First you can go to your taskbar. There you can see your PC time and date . Click on it . You can see full of box . Choose "change time and date". There in first tab you can change time according to you. And in second tab name "additional clock". There you can choose your current city for timing . Also you can follow the some othe steps. Go to control panel >Date and time . After this the steps same like other steps i was suggested you in upper lines. 2. select "region and language option"
3. click on the dropdown box and select "english"
Click on Region and Language Icon. -->>Then choose “English(United State)” from drop down menu. 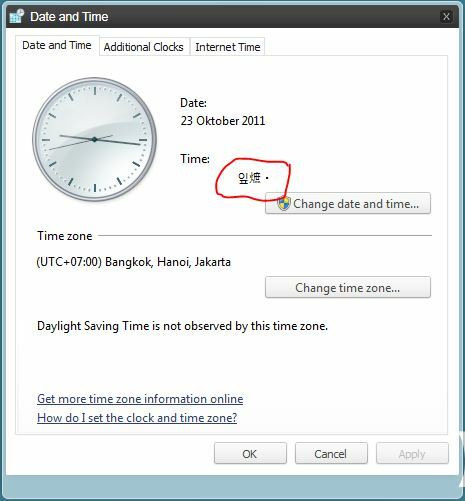 You can easily change Date and Time Format from Arabic to English in Windows 7. ~> Click on Time in the taskbar. ~> Now, click on "Change Date and Time Settings". ~> Now, click on "Change Date and Time Button". ~> Now, click on "Change Calendar Settings". ~> Here, you can easily change the Date and Time Format. We have two ways to change the language preference of date and time. * Open the Control panel from start menu. * Click on Language and Region settingfs. * Choose and click on the wanted language. * Click on the Bottom right corner of data and time. * click on Change settings of Date and time. * Cancel one window and choose language and Region window. * Choose and click on Wanted language. Now See this video you will have a better Idea. 1.click on Start button, open the Control Panel. 2.Now click the “Date, Time, Language and Region”. 3.Under the “Region and language” click the change display language. 5.Now in the Region and language window click OK.
Do you want to change time and date in windows 7 operating system following given steps. 2.click on the control panel. 3.now select clock,region, and language option. 4.here you can change the language and also you can change time and date ..
Let see have a look..
First of go to the desktop and then click on the start menu and then click on the control panel ..When control panel window open you just go and select the Regional and Language options After that click drop down arrow under format and select the language that you want. And at the end click on OK button to save it..
Changing the format in region and language will resolve your issue! Well here, you can also change date and time settings also! 7:After customizing all, click on Apply and followed by OK.
For change date and time format from Arabic to English Follow these steps. Her e click on change location..
Now Go to the Administrative Tab..
2.Under "Region and Language" click "Change the date,time or number format"
1.Go to the start menu and then go to the 'Control Panel'. 2.Then click on 'Clock,Language and Region'. 3.There you click on 'Change date and Time'. 4.Then click on Change calender settings. 5.There in the Formats tab near the format change the language you like. 6.After changing click 'Apply' and then OK.
That's it by doing as i said you can change the arabic format to english. and aslo change date and time. this is best steps for you. 1.Firstly open the start menu and then open the Control Panel. 2.Then you click on the option 'Clock,Language and Region'. 3.And then click on the option 'Change Display Language' under Region and Language. 4.Later you click on the option 'Change Keyboard'. 5.And there click on 'Add' and select the 'English'. 6.At last you click on the option 'Apply' and then 'OK'. ==> First thing you have to do is click on " start " menu there after choose to select on "Control panel "
==>You must go to the "Format " tab and change the "Time settings "
Now the language is changed to English on your windows 7. 1. Click Start and then go to Control Panel. 2. Then click Clock, Language and Region. 3. There you will find two option Date & Time and Region And Language. 4. Click Region And Language. 5. The select English language from the drop down list. 7. The process is done. 2. Then click on Control Panel. 6. Now under Format GroupBox Choose language to "English (United States)"
Open Date and Time Setting . Then Click on change Date And Time link . Click Change Calendar settings. Region and language dialog will be open . change the format from the dropdown menu to English (United state). How to change time format in Windows 7 ? How to change Time Zone on Windows Vista?